Bambu is an organic alternative to coffee. Made from chicory, cereals and sun-ripened figs. No caffeine, no worries - you can enjoy this excellent coffee substitute at any time of the day. Bambu has a high potassium content, helping to support cell activity. It contains chicor which may have a positive influence on the digestive process. 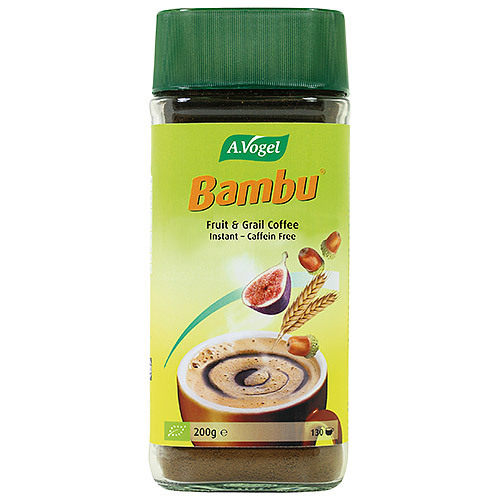 The Bambu Coffee Substitute can be made in the same way as any other coffee. A particularly delicious drink when made with hot milk (including almond or soya milk) instead of water. Chill your coffee substitute in the summer and add ice cubes for a cold refreshment. Extract of roasted Chicory*, Wheat*, Malted Barley*, Figs*, Acorns*. Simply add one teaspoon (1.5g) to your cup and pour on hot water, milk or milk substitute and stir well. Normally, a teaspoon of liquid is 5ml, which is roughly 5g in weight. Bambu is a dry powder and light in comparison to liquid, so 1 teaspoon of Bambu weighs 1.5g. Below are reviews of A Vogel Bambu Coffee Substitute - 200g by bodykind customers. If you have tried this product we'd love to hear what you think so please leave a review. Order arrived promptly. A Vogel Bambu substitute coffee is delicious. I have used Bodykind before - price is good & delivery is prompt. Delicious tasting coffee substitute at a very good price. Prompt delivery.